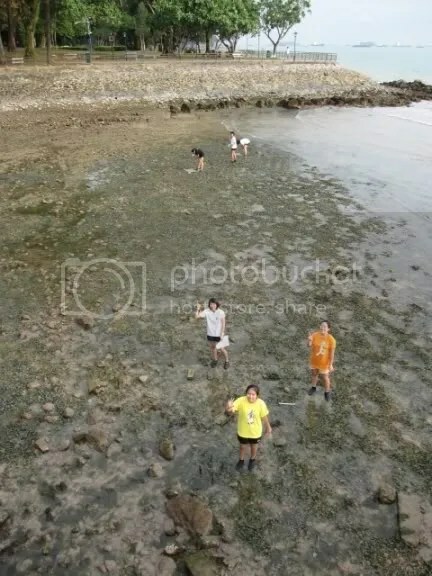 Labrador park | there are actually SEAGRASSES there!! there are actually SEAGRASSES there!! This trip marked our last trip to Lab Park. ): The tide was very low, and we could see a lot of seagrass! (insert pic of low tide). Due to the low tide, we finished our random sampling of 33 quadrats in a relatively short time. 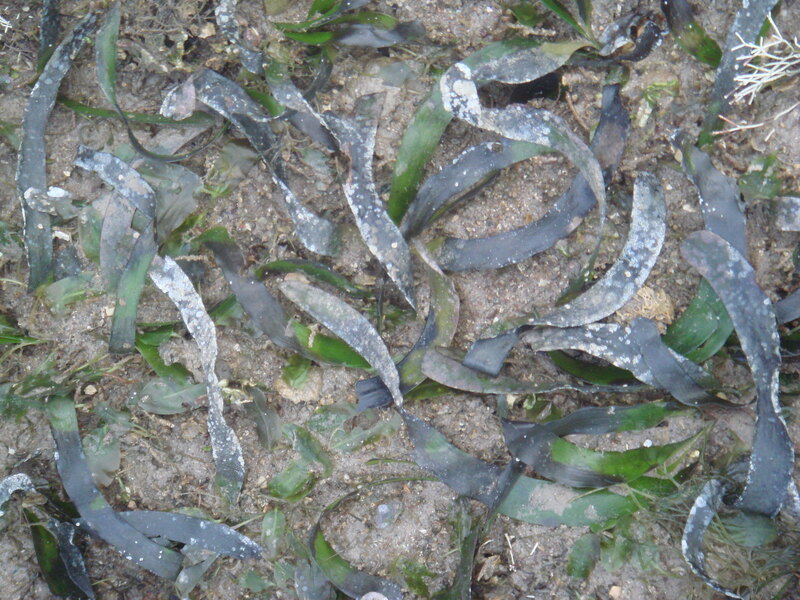 the seagrass generally looked healthy, except for those which were growing near the shore, which appeared to be black. After our monitoring we went to explore labrador park. We spotted white eggs deposited on the Thalassia and many other organisms including shrimps, and a bunch of fat and squishy polychaete worms under the rocks. We managed to explore the other side of Labrador Park which we have hardly ventured into. There, we saw patches of seagrass. However, the patch of seagrass is contained within the rocky shore and is also relatively small, possibly posing a problem to monitering. This may be one of the reasons why it may be difficult to monitor the seagrass in that area. 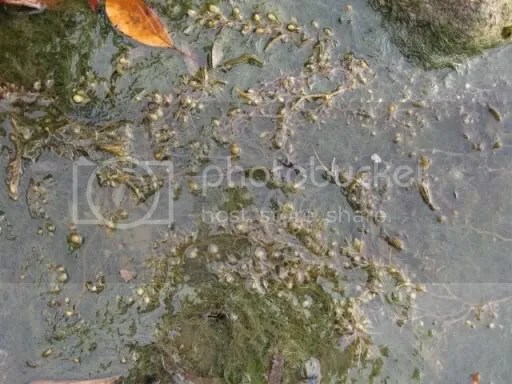 there was a lot of algae washed up and near the shore this time! a shrimp we spotted! It was almost inconspicuous in the water. some thalassia near the shore had turned black for some reason! 25 July was indeed a fulfilling day for our team!The tide was really low at -1.0m so we carried out Enhalus Acorodies monitoring for the first time ever 😀 When we arrived, we found that the gate to the beach was locked and we had to climb over the fence to reach the seagrasses ❤ Thankfully, we crept along the fence to the ramp and walked down safely. 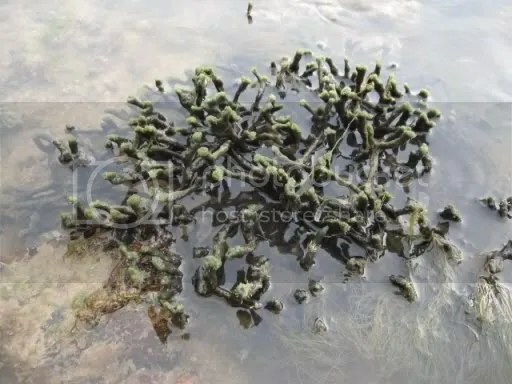 We are glad that no one squished any Onchiidae in their expedition down the “Onchiidae Slope” (aka the inter-tidal zone where onchiidae can be seen during low tide). We started measuring Enhalus plots from further out at sea and moving inwards towards the shore. We measured a total of 10 plots of Enhalus in 9 areas spread out randomly around the seagrass bed. Hua Zhen became very excited upon counting 15 gastropods in the same Enhalus plot. Li Ying went in search of the inrolled leaf margins of the Enhalus as we had previously read about it online. This was a “putting-theory-into-practice” experience and we even took photos to show you! 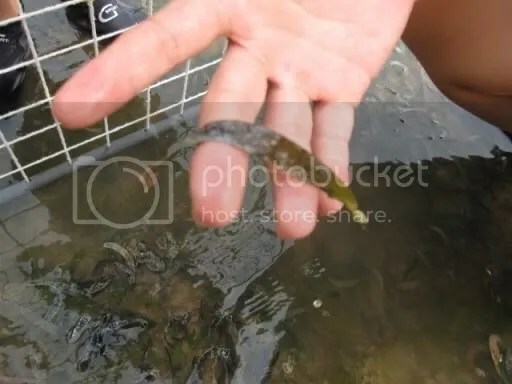 Please look at our photo collection at the end of this post for pictures we took from our trip but before that…..After finishing our Enhalus monitoring, we went in search of our quadrats which we use to track the growth of Thalassia. We were quite worried that they might had been removed by people or washed away by the waves. We were estatic when we found them although they were covered in slimy mud. One of our tent pegs had been washed away too! 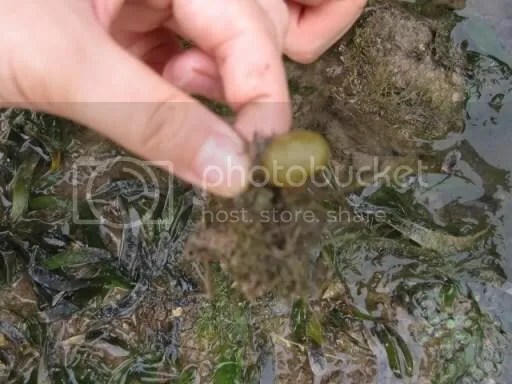 -Two dollars floats away- We definitely can’t wait for another day with low tides so we can replace that tent peg and check the growth of our Thalassia plots. In about 2 months, the Thalassia cover in our plots had already grown by 30-40%. The red algae which was slimy to the touch. Mr Lim told us it was covered in something similar to our mucus. The remarkable inrolled leaf margins of the Enhalus! This makes it hard to tear the leaves. Here are the rubbish we picked up along the beach and inside the sea. 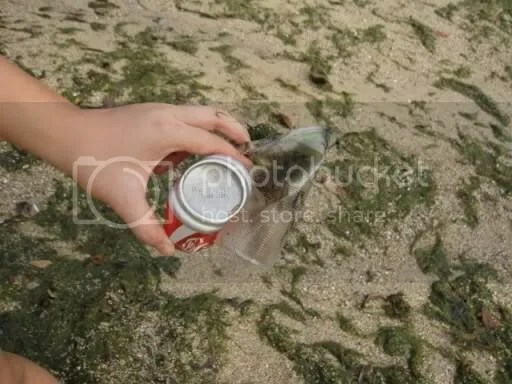 It weighed 11kg in total (shocking) and we appeal to beach-goers to dispose of your rubbish properly as they will endanger the lives of sea organisms. Here’s a picture of our quadrat. and Regina who was regretfully unable to join us during our visit. Went for our second seagrass monitoring on 25th July, Saturday. We started early in the morning at 7.45am, and had to climb over the fence since the gate to the beach was not open. The tide receded to a -0.1, so we could see a lot of things we couldn’t see very clearly last time, such as the patches of thalassia which stretched unusually far out. Monitoring went much faster this time, as we split the work among us, and so got the work done in a jiffy. On top of that, the grey skies forewarned the storm, so we were motivated to work faster. Fortunately, there was only a slight drizzle which we managed to work through. We finished ahead of time, giving us an opportunity to explore the rest of the beach, and observe more of its interesting flora and fauna. a newly formed coral (which will grow around 2cm per year!) So we shouldn’t break off coral because to form a large coral it takes a very long time. 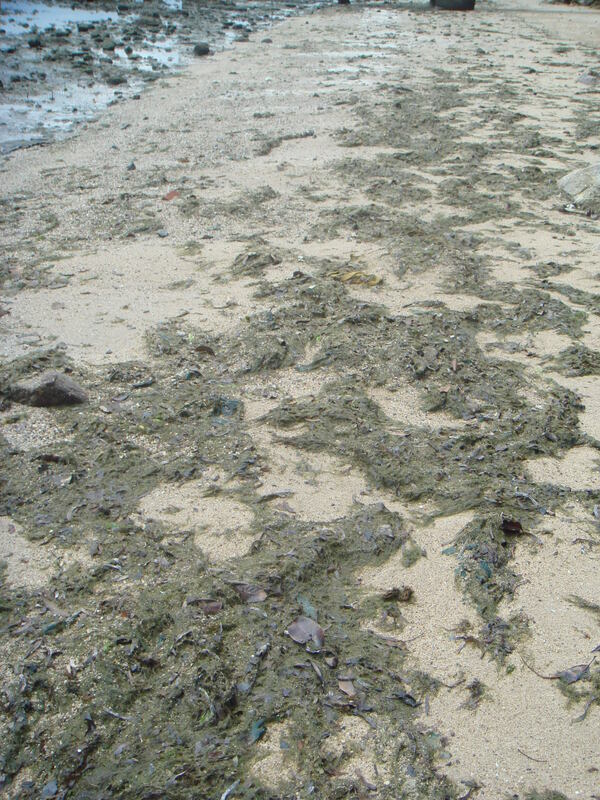 brown algae with air sacs (sargassum) which help them stay upright when the tide is higher. us and the rubbish we collected! On 29th May, we headed down to Labrador Park to start our first official monitoring session on seagrasses. After a demonstration by Mr Lim on how to read off data from the quadrats, we proceeded to do it ourselves. Pinning down our quadrats wasn’t all that easy as the rocks beneath prevented the pegs from penetrating deep down. We had initially planned to thread a fishing line through each seagrass but unfortunately the needle holes on the needles we had were too small for the fishing line to pass through. Hence, we used these sharp tool with needle-like tips to poke holes just above the leaf sheath of each Thalassia leaf. After completing two quadrats, we went to help the other team with the last few of their 33 random quadrats. The beach was relatively clean so we did not pick trash on that day. Three days later, on the 31th May, we went back down to collect the Thalassia in our quadrats in order to monitor their growth. As the tide was a little too high, we could not really see the seagrasses as clearly as on our previous visit. Fortunately, we could locate our quadrats and proceeded to collect the seagrass. The trips to Labrador Park were then followed by the weighing of the biomass of the Thalassia we collected. In the lab, we measured the length, average width, weight, as well as, growth of the baked seagrasses. This time, the seagrasses were a little over baked as the temperature of the oven was set too high. 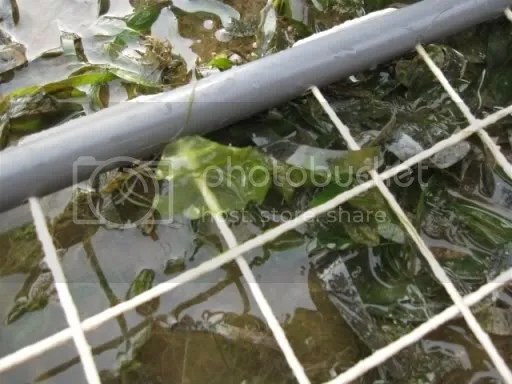 Hence, we had to handle the seagrasses with extreme care as they were rather brittle. This trip has taught us to be well prepared for any emergencies like how the fishing line couldn’t thread through the needle, as well as to prepare all equipment well beforehand so as to ensure that we can carry out seagrass monitoring and collection well. 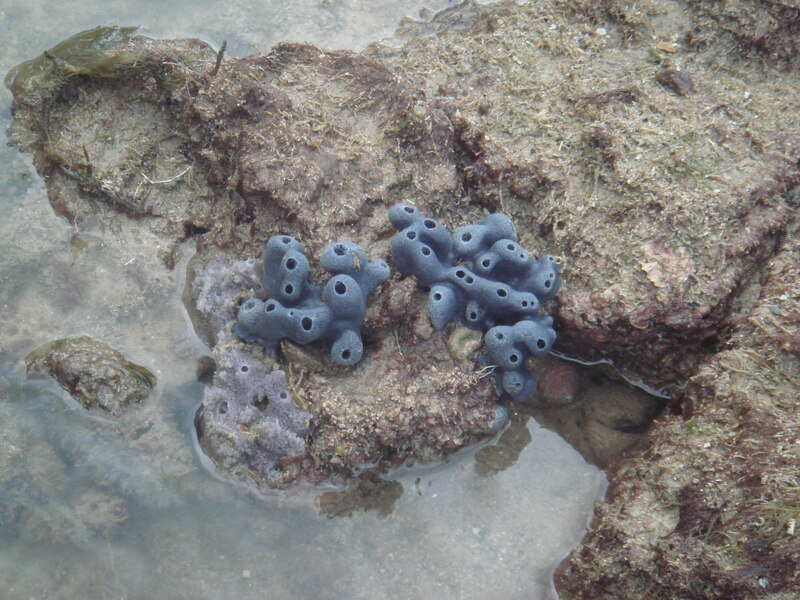 We look forward to our next exciting trip to Labrador Park on 25 July, where we may also try out monitoring Enhalus. Finally we have officially started on field work at lab park on the 29th May! (finally got to put our booties to good use too!) We learnt how to estimate percentage coverage, algae cover, sediment and canopy height. Doing it for 33 quadrats was back-breaking work, but we can now say we are able to identify different seagrasses and algae with confidence, and faster too! The area was mostly populated with Thalassia hemprichii, but we did manage to identify Halophila ovalis, and a patch of Enhalus acoroides, which was much longer than we thought it would be. 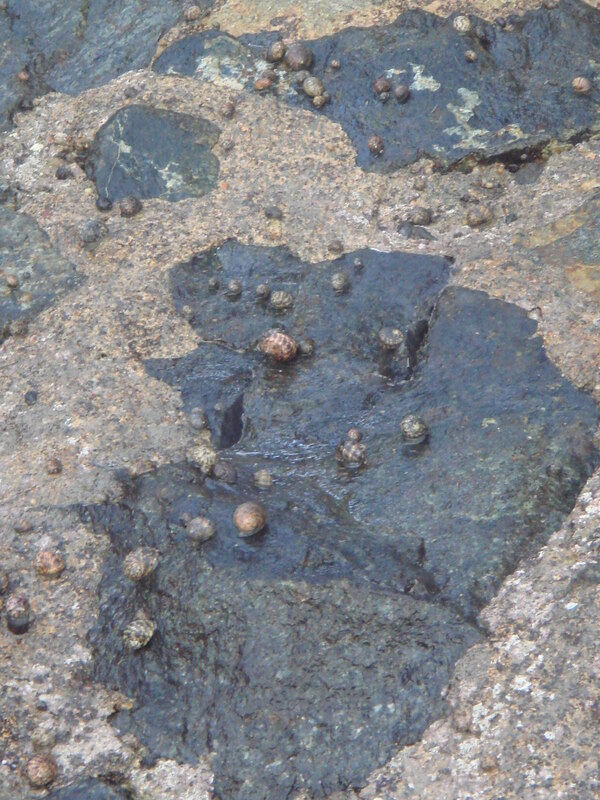 We also saw crabs, snails, shrimp burrows, blue sponges and many other interesting organisms! we tried to identify the pictures by putting our fingers in, but it didn’t work out and we noted the picture number in the end. A hairy crab that Mr Lim pointed out to us! We took turns holding it too. As for our beach cleaning adventures, it was unsuccessful! Because, to our surprise, the beach was very clean. Mr Lim told us that it was because there were cleaners who did periodic cleaning at the beach. We will be going down for another session soon! First team: Grace Cheong, Jin Yifeng and Zenia Quek. Second team: Goh Hua Zhen, Regina Lau and Tan Li Ying. 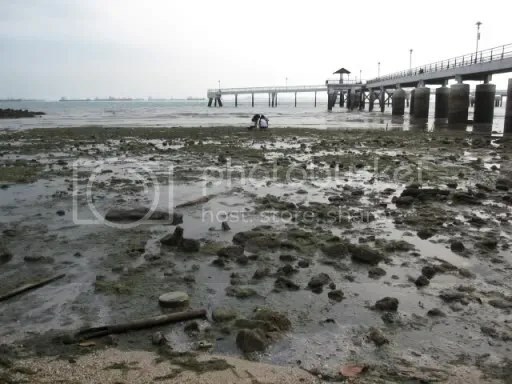 The main objectives of our project, working together, are to maintain Labrador Park so as to clear the marine waste washed on shore, and to map out the distribution of the different species of seagrass. Our mapping is aimed at aiding future research and recreational activities to be done at Labrador Park. Our first team will be focusing on the distribution of seagrass Thalassia hemprichii, Enhalus acoroides and Halophila ovalis. Our second team will be monitoring the growth of seagrass, so as to find out the factors that affect growth there! 2 Fridays ago, 8 May 2009, we took our first trip down to Labrador Park. 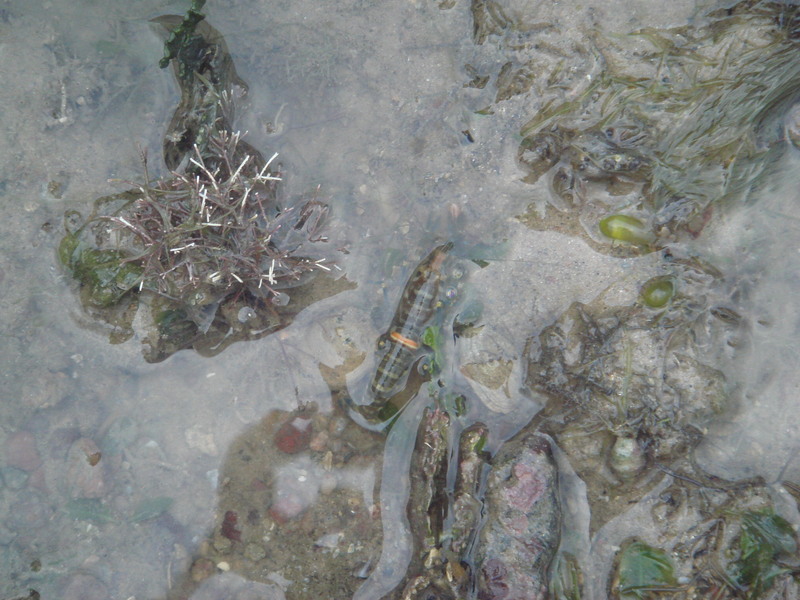 We were introduced to various marine organisms that can be seen on the rocks in the intertidal zone, such as Onchidiidae, small crabs and Polychaete. We learnt the right and safe way of opening rocks so as to prevent attacks from marine creatures which reside underneath. Our teacher-mentor, Mr Lim, taught us how to identify algae and the various species of seagrasses. We had the chance to try out our new booties! (: He also taught us about the ecological relationships between the corals and seagrasses, and showed us the calcium carbonate skeleton of a dead coral. It was a fulfilling trip to Labrador Park and we are certainly very excited about our next trip! 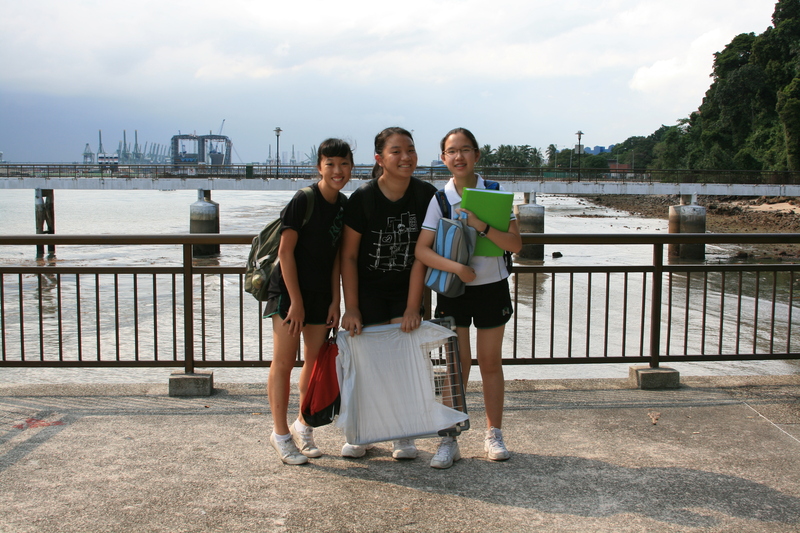 On the 10th of February 2009, we concluded our last formal trip down to Labrador Park for our data collection. The weather that day was great, windy and not very hot (since it was about 5.30pm). 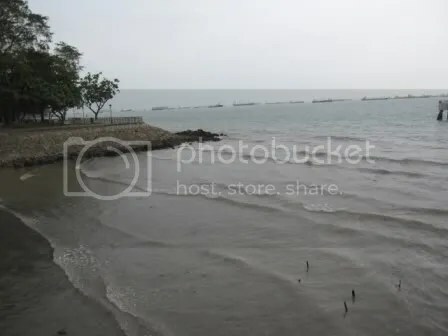 Although we had to wait for the tide to recede yet again, we did not really mind it this time and spent our time taking photos of the beach and of our plots. that’s us standing at the location of our 3 plots! The 3 plots are about 2 metres away from each other. 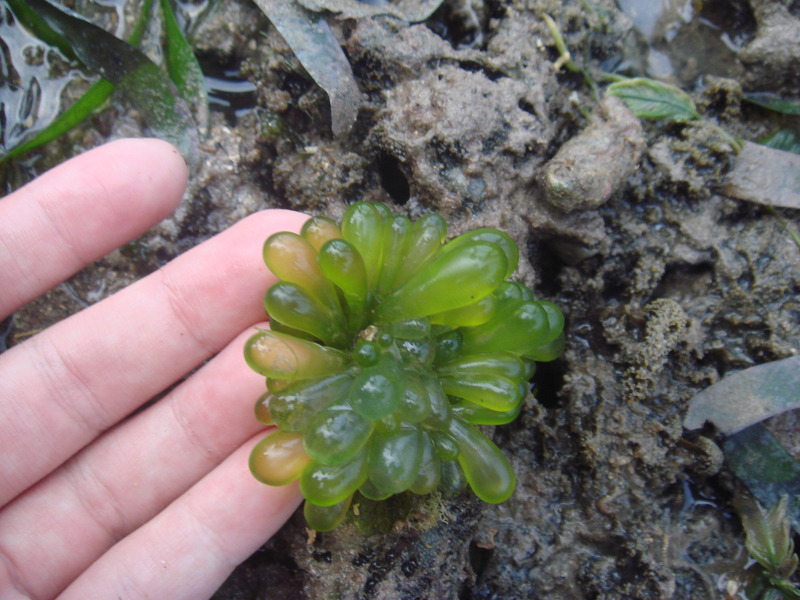 As we could not find 2 dates with low tides that are 4 days apart, we could not conduct another fishing line growth experiment on our Thalassia hemprichii. Instead, we could only monitor our 3 plots of seagrass, as well as collect the seawater sample again. This time, we discovered that many of the Thalassia had turned brown! at first, we thought it was a very bad case of epiphyte, but Mr. Lim attributed this find to the extremely dry weather recently, so the Thalassia have been “sunburned”. And much of the time was also spent on popping the air sacs of the brown seaweed (Sargassum), which was our new obsession! 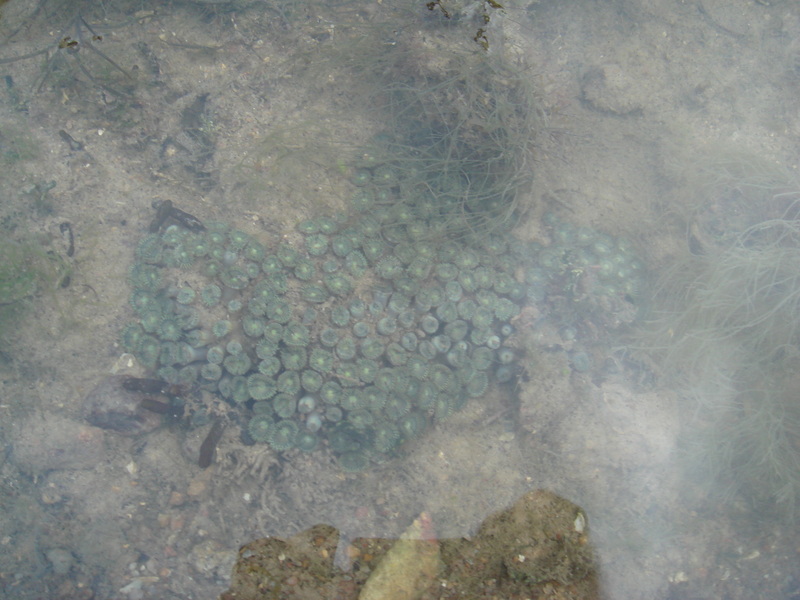 this time, instead of the usual blue anemone, we saw green anemone! this is our last trip down to labrador park, and we’ll miss that wonderful place very much. also, thank you for everyone who helped us with this project, it has been very meaningful. 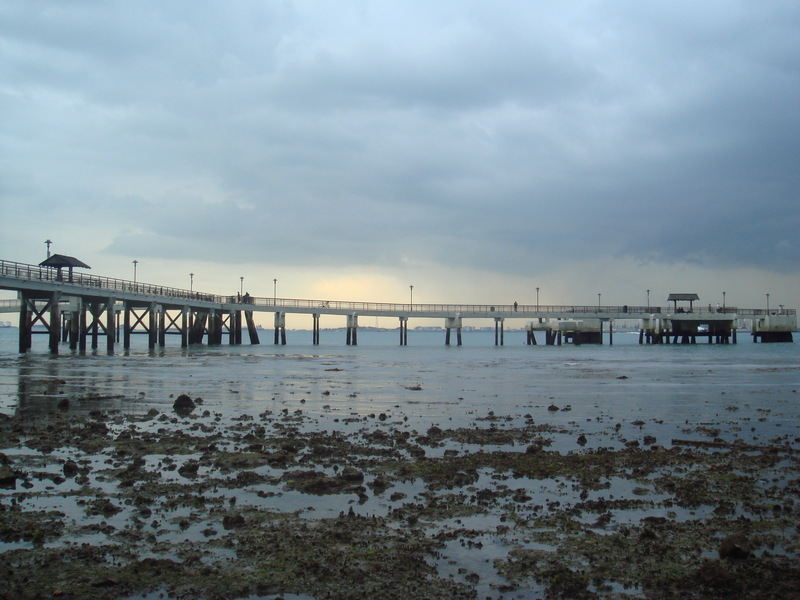 This site is about Labrador Park and the seagrass ecosystem at the beach. We are a group of students monitoring the seagrasses there, namely Halophila ovalis, Thalassia hemprichii, and Enhalus acoroides. And yes, there ARE seagrasses there. 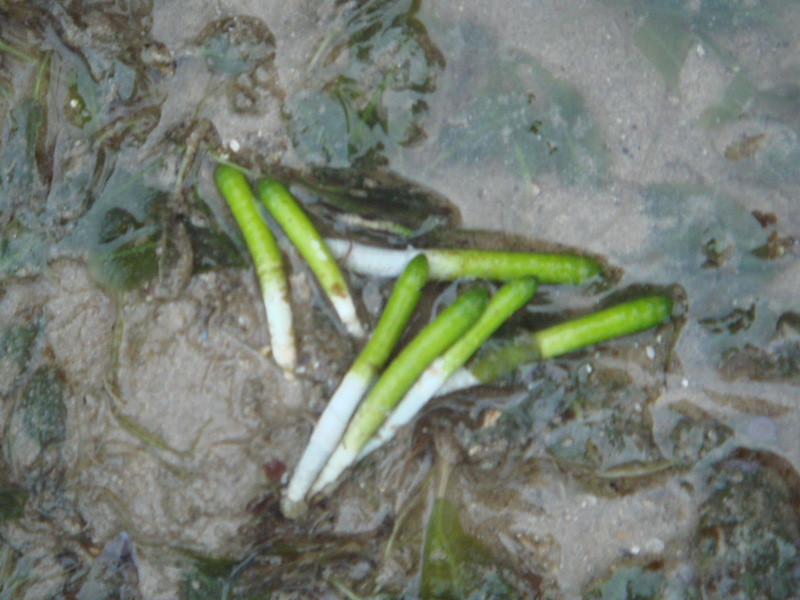 Seagrasses are ANGIOSPERMS(flowering plants) and NOT seaweed or algae. Similar to their counterparts on land, they thrive better in tropical climates than temperate ones. 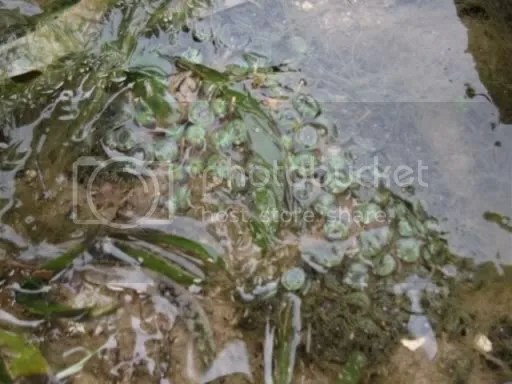 There are 11 species of seagrasses in Singapore and they can be mostly found at Chek Jawa, west of Pulau Semakau, Labrador Beach, Cyrene reefs and Tuas.